Meet Teresa, she's a Scorpio. On her body is “El Pulpo” stealing Pacificos from a cooler of the pescadores, as the legend tells. She’s designed by Sterling Hundley. She currently resides in Chicago, Illinois delivering cold Pacificos. 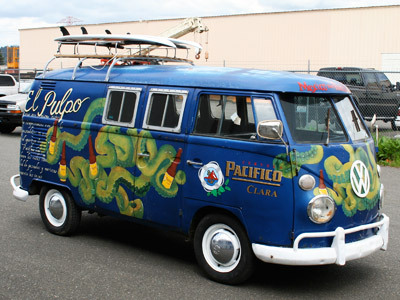 Some report the Pacificos are mysteriously missing once in a while from the back of the bus. himself, and the lettering on the back of the van and all the beer bottles. Woman in Yellow, I did everything, except the logos, my daughter did those, and the mountains, my friend basecoated those. This is awsome to see them in their new homes. Francine, you do AWWWEEEESSSOOMMMEEE WORK!!!!!!!!!!!!! !